A powerful windstorm rolled through the Pacific Northwest today, felling trees, knocking out power, and forcing the closure of roads and bridges. 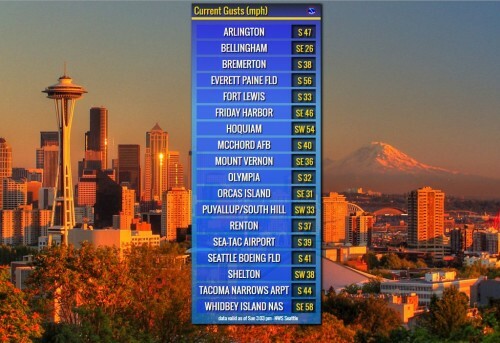 Gusts of more than sixty miles per hour were reported in many places, like Seattle’s Discovery Park, which recorded a peak gust of sixty-six miles per hour at 4 PM. Winds were also fierce on the Washington and Oregon coasts, where even more powerful gusts were reported. The Washington State Department of Transportation shut down the Evergreen Point Floating Bridge across Lake Washington and the Hood Canal Bridge due to high winds. No estimate was given for when either might reopen. Part of Highway 99/Aurora Avenue North also had to be closed due to downed power lines. A large truck tipped over on the Tacoma Narrows Bridge, necessitating an emergency response and a cleanup. Fortunately, no one was hurt. Several Washington State Ferry runs were cancelled or running behind schedule. Sound Transit advised riders to expect long delays. 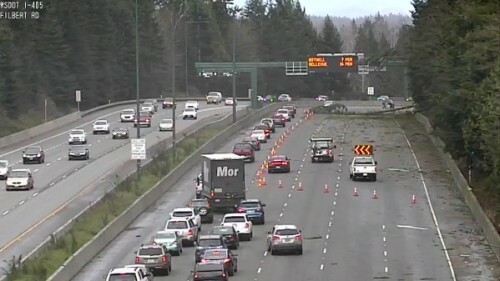 “Please expect delays today on all Sound Transit Express Sunday routes as a result of high winds and fallen trees causing blockages on multiple roads ways and highways. Visit the WSDOT website or check media reports for updated information,” the agency said in an emailed alert. A falling tree in Seattle’s Seward Park crushed a vehicle with occupants inside, killing a man. A toddler also inside the vehicle survived and was rescued by passersby. The toddler was taken to Harborview Medical Center. More than 200,000 were said to be without power in the greater Seattle area. More than half of those are customers of Puget Sound Energy. PSE says it could be some time before everyone affected gets their power back. Crews cannot work when conditions don’t allow, and it’s still pretty blustery out in a lot of places. Snohomish PUD had at least 27,000 customers without power. Both suburban and rural neighborhoods were affected, according to the utility’s outage map. Tacoma Power’s outage map likewise shows places all over the county without power. Authorities are reminding residents to report and stay away from downed power lines, avoid grilling indoors (it can cause death due to carbon monoxide poisoning), and delay or cancel trips if at all possible due to unsafe road conditions. Will State Route 520 toll make bridge backups mostly a thing of the past? That was one nasty storm. Lights were flickering in the Lake Wilderness Starbucks where we were holding a caucus training meeting. At one point the power did go off, but in a minute or more, it was back on.